Your dog is welcome to coat care and tidying up! 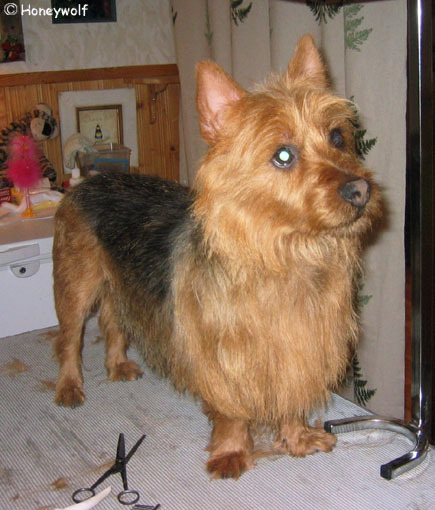 Having been in the business for well over twenty years, I’ll groom your pet skilled and experienced, stripping the rough coated breeds correctly, and for the soft-coated ones I’ll do a pretty and tidy everyday cut with scissors and/or clipping machine. 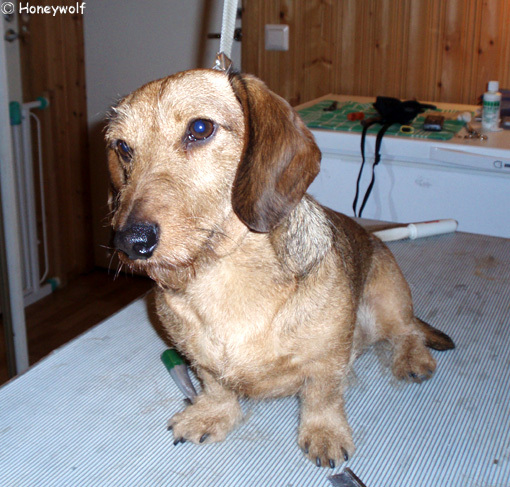 I can prepare your terrier for a show, and also a schnautzer and a dachshund if you like. I’m always treating the dog in a friendly and calm manner, without hurting him or provoking anxiety. I desinfect the table and the tools between groomings. You will find the map and driving directions here. I understand if you want to take your dog to the groomer tidy and clean, but please do not wash the rough coat later than two weeks before the treatment. 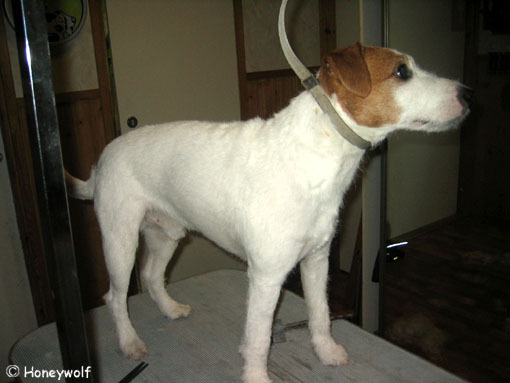 It’s very hard to strip a newly washed coat, and it’ll be troublesome for both the dog and the groomer. Instead, do comb a soft coat carefully first and then wash it. 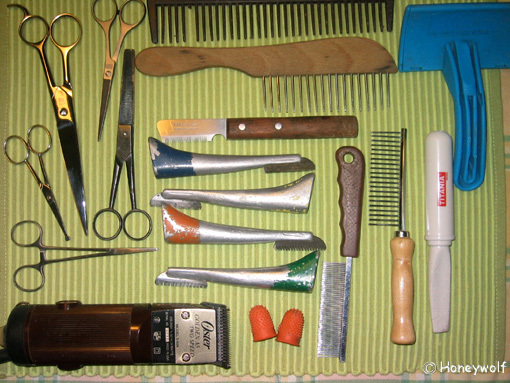 Dirt and sand in the coat will make the scissors and the clipper blades obtuse. I wish that you would comb the coat thoroughly before the grooming. 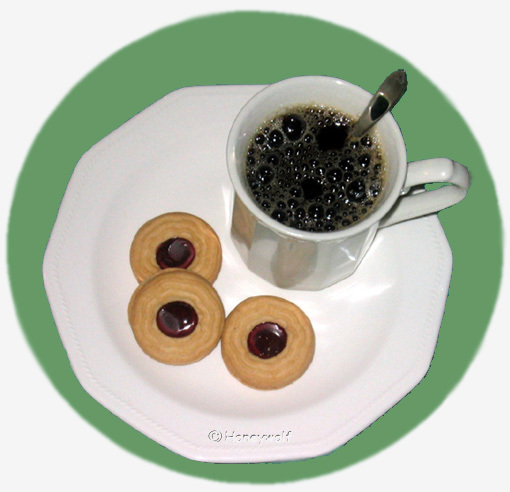 This is essential for fluent working. If there are lots of tangles, the grooming time will be prolonged and the costs will go up – and it’ll be a miserable session for the dog. When a soft coat is very tangled, it must be clipped shorter than ideal. If it’s a rough coated dog, two separate handlings may be needed: first the combing and removing of tangles, then the grooming. 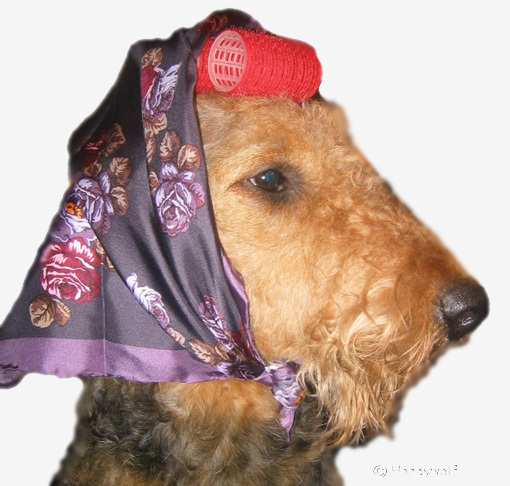 This may be the case with some very laborious breeds like the Airedale terrier. If there are just a few tangles, they don’t matter a thing. The new dog owners may often think that they are untangling the coat, when in fact they are combing just through the upper hair layer, and the soft down hair is left untouched. Do press the comb down to the skin! If you don’t succeed in combing through right away, untangle the coat with a card. After the card has removed the excess wool and tangles, you can work through the coat first with a sparse comb and then with a dense one. This will help the skin to breathe freely. There may also be sharp seeds, sand and other skin irritating things in the down hair. Unfortunately I haven’t got the possibilities to bathe your dog. Please walk your dog properly before the grooming. Give him also water, if you think that he might be thirsty. It must be very hard for the dog to stay on the table for hours, if he’s got lots of energy to spare, if he needs to urinate, or if he’s thirsty. Right off you may stay and observe the grooming if you like, but just prepare yourself for a session lasting for several hours. The handling time may be prolonged too, as the dog usually is more restless havig his owner near. 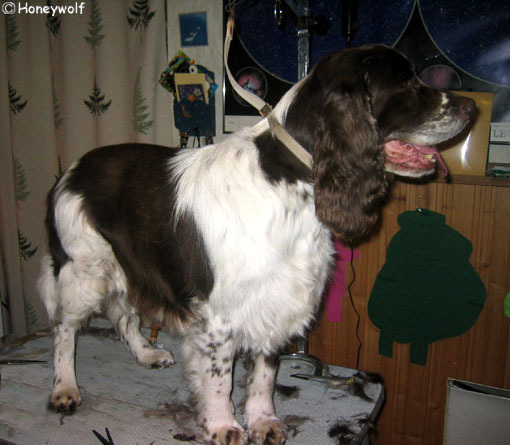 A stripping will generally take 3-5 hours, some sole breeds and specimens excluded, and a clipping will take 1-2 hours. While you are absent, you can fully trust on that I will treat your dog kindly and calmly. He will certainly be happy and satisfied when you come for him, though possibly a bit more tired than usual in the evening. Please take some cash money with you for the payment – I usually don’t give invoices. A little later it’ll be possible to pay with a cash card. 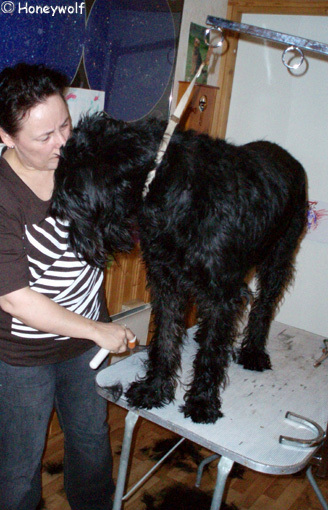 A dog coming for grooming must be vaccinated against parvovirus and distemper. Please don’t let your dog defecate on our yard or on the road in front of us. If he however does this, do collect the droppings in a plastic bag. It is forbidden to throw smoken cigarrettes on the yard or on the road. Please try to arrive about at the agreed time. It’s easy to find the way, and you don’t have to take extra time for seeking. Our yellow house is lieing quite near the main road a few kilometers from the village center to the Naantali direction (map link: Nuikontie 10, Rymättylä). The driving time from Naantali is about 20 min, from Raisio about 30 min, and from Turku 30-40 min. 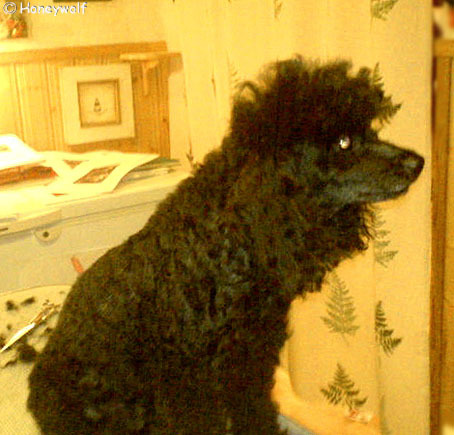 If you’d like to learn how to groom your dog yourself, I’ll advice you and show you how! 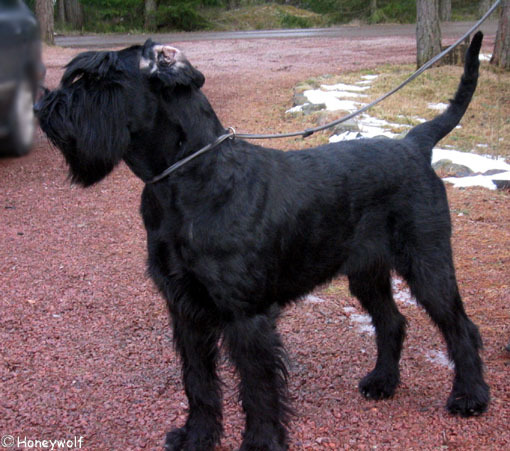 The most delightful giant schnautzer boy Zorro. I didn't put final touches to the neck and chest yet.